Treasure Island and The Strange Case of Dr Jekyll and Mr Hyde are world-wise best sellers, frequently re-published and translated, adapted as films and graphic novels. The writer’s works go beyond these books. The Master of Ballantrae, Kidnapped and The Black Arrow are also widely read, as are all his novellas, poetry and tales of the south seas. The writer left Scotland, where he was born in 1850, in search of a climatewhich would soothe his respiratory illness. He ended his days at the age of 44 amongst the inhabitants of Samoa in Oceania. In the interim he had travelled widely in Europe: by canoe from Antwerp to Pontoise in France; and on foot in the Cévennes with his donkey, Modestine. He stayed near Fontainebleau, where he frequented the artists’s colonies of Barbizon, Grez-sur-Loing and Châtillon-sur-Loire. He also wrote in Switzerland, lived in the United States and sailed in the Pacific. For Stevenson travel was not a pretext or an escape, but an opportunity for encounters. The accounts of his travels in Europe are regarded as genuine ethnographic descriptions of peoples and lands. When he reached the Pacific islands, Stevenson wrote novellas and short stories which give a thoroughly fresh view of the societies of Oceania which had previously been seen through the lens of colonialism. Robert Louis Stevenson is at the heart of our network. A network built around the sharing of lay and humanistic values​​, based on openness to others and tolerance of differences. 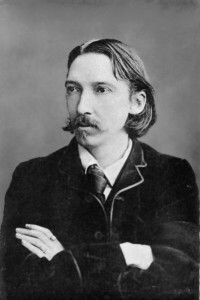 Writer, traveller, adventurer, idealist, Stevenson left his mark on the places he visited through his literary work and his profound compassion for humanity. Stevenson’s qualities are reflected in the diversity of our network; which includes charities, projects supporting people experiencing social difficulties, tourism professionals, heritage associations and sports clubs. This diversity brings a richness to this European network whose members share a common goal: to transmit the values of the writer, his open-mindedness and openness to the world, along with the beauty of his great literary work. The hallmark of our network is its human dimension marked by friendship between all the ambitious small structures that have come together around a common project: to demonstrate the existence of a European literary heritage, and thereby encourage the concept of European citizenship.